Generoso and Lily’s Bovine Ska and Rocksteady: Jamaican Halloween Reggae And Ska 10-27-15 – LILY & GENEROSO 4EVER! Halloween Without King Horror? Never! Happy Halloween Bovine Ska and Rocksteady Listeners! Truthfully, back in 1996 when I put together my first Jamaican Halloween radio show at WMBR, I couldn’t find more than a couple of sets spooky reggae and ska from 1955 to 1975 but year by year just like the lost souls rising from the beyond, we have found a coven of rare Jamaican cuts to make a two hour show of eerie sounding reggae, ska, mento, and rocksteady happen! This year’s show was a blast as we mixed those cuts that feature horrifying screams, corpses rising out of graves, and heavy rhythms with some haunting sounds of our own, and Lily’s explanations of the different types of undead apparitions which was pretty mind-blowing! In years past we always did a half-hour spotlight of the enigmatic vocalist known as King Horror but being that Mixcloud does not allow so many tracks glued together from one artist, we played a greater variety of Halloween reggae and ska than ever before! 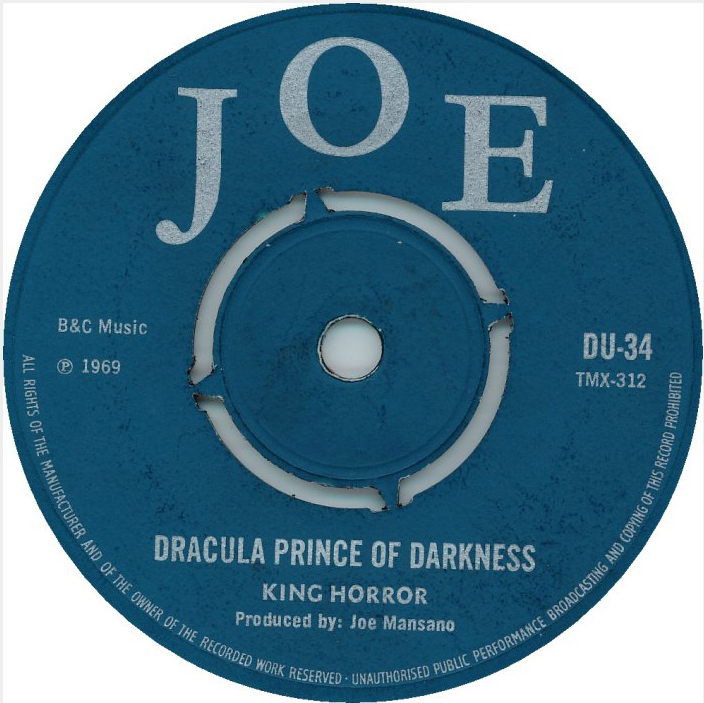 Of course, we did start the show with King Horror with what could be the most bizarre organ intro of any track we will play this evening…The Joe Mansano produced 1969 classic, “Dracula Prince Of Darkness!” In fact, the first set of four songs was a tribute to the former Vlad The Impaler and his urban counterpart, Blacula! We followed King Horror with a creepy one from the Crystal label house band, The Crystalites with “Blacula” from 1973, The Vulcans 1973 cut for Trojan, “Dracula,” and The Upsetters ending that set with their homage to our fanged friend, “Dracula” from 1970. We had a mento set that began with an appropriate selection from Chin’s Calypso Sextet, “Woman Ghost Fool Man” and ending with the classic “Zombie Jamboree” performed by Lord Jellicoe in 1966. We ended the first hour with a ska set that included such holiday wonders as Byron Lee and The Dragonaires “Frankenstein Ska” from 1964, and our favorite dark ska cut, Lloyd Clarke’s “Living Among The Dead” which Lloyd recorded in 1964 at Federal. The second hour featured a six reggae tribute to satan with a highlight being “Dr. Satan’s Echo Chamber” by Rupie Edwards from 1974, and a nine song version to version laden set of “duppy” (Jamaican for ghost) including four versions of Bob Marley and The Wailers Duppy Conqueror performed by The Wailers, Dennis Alcapone, and The Joe Gibbs All Stars. You can hear our full show from October 27th, 2015 HERE. Subscribe to our show on Mixcloud, it’s free and you’ll get an email every Tuesday when our new show goes up. Happy Halloween!!! Please help us and spread the word and repost if you liked the show! Repost anywhere you see fit. Join the group for the radio show on Facebook.